Learn to make a homemade laundry soap and stain stick using just three ingredients. Also included is my easy recipe for laundry detergent. 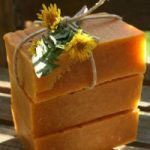 Unlike my other natural soap recipes, this one is intended for laundry purposes only. It has no extra oils or fats in it, making it better suited for cleaning tough stains on clothes rather than using on your skin. 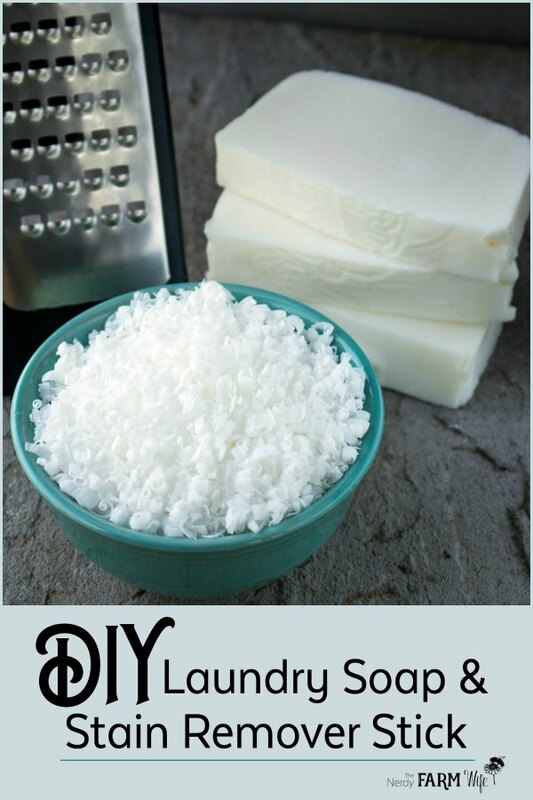 You can turn it into homemade laundry detergent, and/or cut it into stain sticks. I detail both methods below. I usually leave the recipe unscented, but you could add 18 to 20 g (about 2 tablespoons) of lavender, peppermint, lemongrass, or your favorite essential oil blend to the recipe, stirring it in at trace. 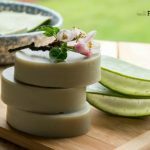 This recipe was first shared in my bestselling book, 101 Easy Homemade Products for Your Skin, Health & Home. 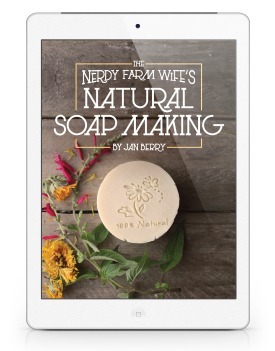 For even more natural soap recipes, be sure to check out my second print book, Simple & Natural Soapmaking. Both can be found on Amazon, or check with your favorite book seller about ordering it! You’ll also need a loaf style mold. I use Crafter’s Choice Regular Silicone Loaf Mold – 1501, from Amazon. Brands of lye that I use and recommend include: Red Crown High Test Lye, ComStar & Essential Depot Food Grade Lye – all can be found on Amazon. Check the bottled water section of local stores for distilled water, or you could also use deionized or RO water. Yield: 8 bars of laundry soap, or 16 stain sticks. Important Note: Please notice that unlike regular soap recipes that require 24 hours in the mold, coconut laundry soap should be removed from the mold and sliced into bars as soon as it’s hard enough to do so. Waiting even 24 hours will likely make your soap too hard to cut into bars. Since the lye could still be active after just a few hours in the mold, be sure to wear your gloves while cutting. This is an abbreviated overview. 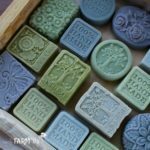 Please see my more in-depth article, Soapmaking 101, if you’ve never made soap before. Place the water in a heatproof container. Pour the lye into the water and stir well. Avoid breathing in the temporary strong fumes. Set the mixture aside to cool for 30 to 40 minutes, or until around 100 to 110°F (38 to 43°C). While the lye cools, warm the coconut oil to around 90 to 100°F (32 to 38°C). Pour the lye solution into the warm coconut oil and stir by hand briefly. Use the immersion blender sparingly, to bring the soap to trace. Pour soap into loaf mold. Check in 2 to 3 hours. If firm enough, slice into bars, while wearing your gloves. Set the bars on sheets of wax paper. If making stain sticks, cut into stick shapes, then cure about 2 weeks before using. After slicing the soap into bars, slice each bar again into halves, to create easy-to-hold stick-shaped pieces. Let cure for around 2 weeks. Wet the soiled garment with plain water and rub the soap directly on it until a lather forms. Launder as usual. These stain sticks should work on most machine-washable clothing, but always do a spot test first to be certain. I keep my laundry recipe really simple. It’s worked great for my family for many years! Please note that I have hard well water and wash most of my laundry with warm water in a top load washer. I know several people who use this for their HE machines with no problem. In the past, I could buy super washing soda locally, but that’s no longer the case. Instead, I now buy it from Amazon. optional: 1/2 to 1 teaspoon essential oils, such as lavender, lemon, peppermint, etc. 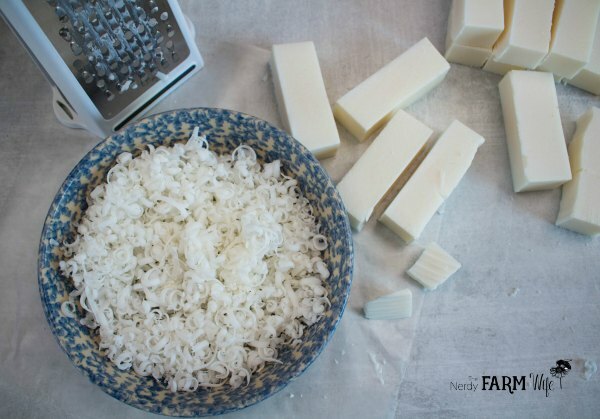 Add the grated soap and super washing soda to a food processor. Pulse the mixture until it’s completely mixed, with no visible flakes of soap remaining. Stir in the essential oil, if using. If the soap is very fresh and still warm, spread the mixture out in a shallow dish or pan to cool before storing in a jar or container. The amounts given in the recipe above yield roughly 2 1/2 cups washing powder. Use 2 to 3 tablespoons per load of laundry. 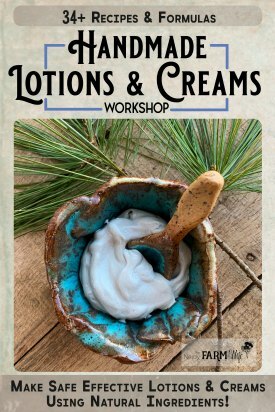 Can you make laundry soap/detergent with other oils? I once used coconut oil on my face and it broke out as a result I don’t even want to try mixing it with anything else to use as a moisturiser. And because of the breakout I’m thinking perhaps it would irritate my skin after washing clothes with the coconut oil detergent – I don’t want to make a whole batch to try it out. Hello Jan, first of all, thank you so much for share with us your amazing recipes and tips, It helps a lot…. Sorry about my ignorance, does washing soda is the same as baking soda? can we youse baking soda al laundry soap instead of washing soda? Thanks, Send you regards from Mexico. Hi Aide! That’s a great question! I had always wondered that myself before. 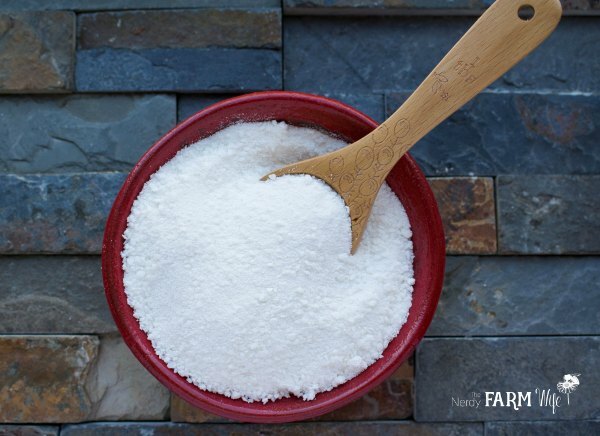 It’s a little different, but you can make your own washing soda from baking soda. Love your books – Just thought I would add a tip. I find it easier to peel the soap rather than grate it. Peeling works even better when the bar is really hard as it make the soap into a fine powder. I used to keep my soap in the hot water cupboard to harden for that very purpose.